This is the pattern on the other side of this piece. "Poema is a lyre made to the original size of lyre, was a stringed instrument referenced in the Bible. 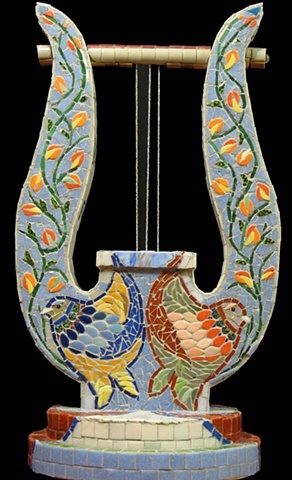 It is believed that lyre was the instrument king David used when he wrote the psalms. The strings are beaded to show some depth." If you want to donate this to a church, this will be a tax deductible purchase. Please contact me if you need help with that.